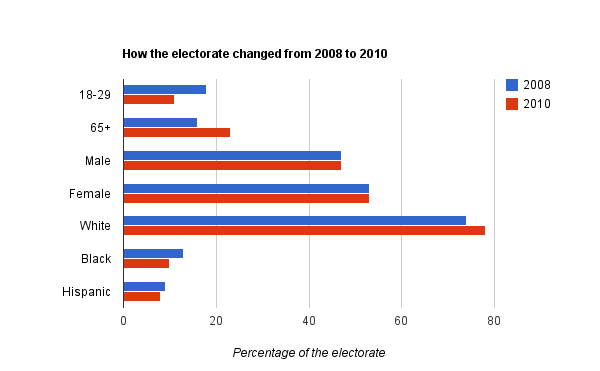 Ezra Klein has a great graphic covering the differences between voter turnout between the 2008 and 2010 elections. Takeaway message- don’t count on youth votes outside of high-profile presidential elections. They just aren’t there. I think you need to show these results in relation to the considerable overall voter (reduction)suppression that happened in 2010. In 2008 Americans were believing they could make a better world so %65 to %70+ turned out 2008 vs %50 to %55 turnout in the face of massive corporate money dumped to push 2 ideas: A) that they should be angry and blame mostly in-office Democrats B) that everyone in office is corrupt(no matter how big a lie had to be told) so why vote at all (unless you are angry).ALSO the items of student voter registration problems are disconcerting. I’m not surprised that youths aren’t voting, who would they vote for? There’s no one out there that represents their interests.